NOVA professionals love spending time with clients, educating them on the services we offer. 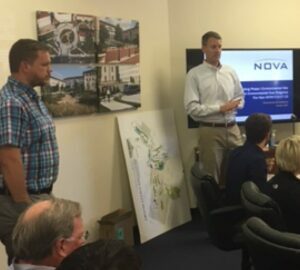 Nick DaSantos and Steve Willenborg recently stopped by Kimley-Horn’s Alpharetta location and spent lunch with their group. The topic of discussion was “Understanding Phase I Environmental Site Assessment – Environmental Due Diligence – The New ASTM E1527-13”.